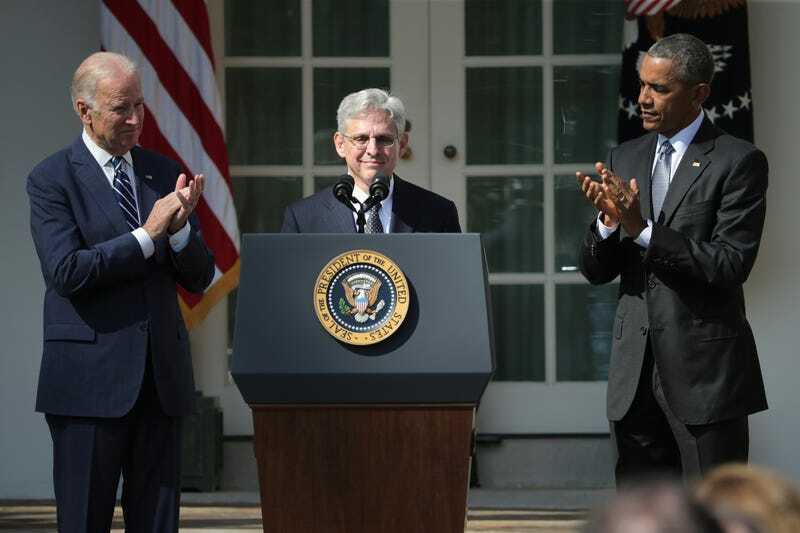 This morning, after weeks of speculation, President Obama tapped Chief Judge Merrick Garland of the D.C. Court of Appeals to assume the Supreme Court seat vacated by the late Justice Scalia. But the president’s formal announcement of his choice from among many attractive, well-qualified candidates is just the beginning. (No, this does not work like The Bachelor). A Supreme Court justice gets a lifetime appointment to a job in which he or she is expected to wear pajamas to work every day. With perks like this at stake, filling the occasional vacancy is a competitive, exhausting process that can take months to complete (and even then, it still might not work!). With Chief Judge Garland officially on the clock, here is your mostly legalese-free guide to how America makes a Supreme Court justice. The president–kind of. Article II, Section 2 of the Constitution states that the president “shall nominate, and by and with the advice and consent of the Senate, shall appoint” justices to the Supreme Court. Depending on how well your AP Government exam went, the phrase “checks and balances” might come to mind. If so, good! The Constitution empowers the president to suggest the next would-be justice. But to prevent the court from being composed entirely of presidential lackeys, the Senate must agree before the president can actually install a nominee on the bench. Although White House staffers vet candidates for dubious tax returns and racist Facebook posts, there are no formal qualifications for serving on the Court. A justice need not even be a lawyer, so if the Donald isn’t president come November, nothing other than, one hopes, common sense prevents Justice Trump from becoming our new national nightmare. (“LAWS, yes, I know many laws, and I will enforce them BEAUTIFULLY”). Technically, Senate approval requires just a simple majority vote. But after President Eisenhower nominated John Marshall Harlan II in 1955, Senator James Eastland, a horrible old man who called segregation the “correct, self-evident truth” and “the law of God,” furiously urged the Judiciary Committee to require that Harlan appear to defend his “pro civil-rights agenda.” Harlan was easily confirmed, and when Eastland died the New York Times called him “little more than a symbol of a vanished age of white supremacy.” But Harlan’s nomination kicked off the modern practice of requiring all Court nominees to first testify before the Senate Judiciary Committee. “Testimony before a Senate Committee.” Sounds … scintillating. Bork earned his own Merriam-Webster’s entry as a cautionary tale for nominees, who now uniformly refuse to discuss their ideologies in Committee hearings. Unfortunately, these are the only questions to which Committee members really want answers. With personal beliefs off the table, filling several days’ worth of hearings can be … challenging. Justice Kagan mocked this dynamic years before her nomination, chiding Committee members for engaging in a “peculiar ritual dance” in which “they propound their own views on constitutional law, but neither hope nor expect the nominee to respond.” But with her own appointment at stake, she clammed up, too. For nominees, this is good strategy. The Senate confirms more often than it rejects, and hopefuls know that they are more likely to say something stupid than they are to deliver an eloquent, flawlessly reasoned line that convinces opponents to change their minds. So nominees grit their teeth, deliver answers boring enough to drive attending Senators to crossword puzzles, and pray Diet Coke doesn’t come up. Although some bemoan the EMPTINESS OF IT ALL, there are some good separation-of-powers justifications for this kabuki dance. Despite the fondest wishes of bad people, Supreme Court justices are not elected officials whose performance is subject to ballot referendum. The Court protects minority interests that the unfettered political process might otherwise ignore. Thus, nominees do not make political promises because they do not view their ideologies as relevant to their task of fairly applying the law. (I know. That’s the IDEA. Please stop laughing). If everyone knows the nominee won’t say anything, why have hearings at all? Prepare to be shocked: politics. Although nominees tend to be respected, well-qualified jurists (sorry, Harriet Miers), the Committee members charged with evaluating them often are not. During her 2010 hearings, then-Senator Tom Coburn asked Justice Kagan for a very specific favor. COBURN: It’s my appeal for you to go back and look at The Federalist Papers … I thought they had tremendous wisdom. They weren’t—they didn’t get it all right, but they sure got a lot of it right, and the proof’s in the pudding of where we are today. KAGAN: Senator Coburn, I said in my opening statement that I was only going to make a single pledge … but I’ll meet you another. I’ll re-read The Federalist Papers. Refresher: the Federalist Papers are a collection of essays written by James Madison, John Jay, and Alexander Hamilton, and are probably the most famous documents in the Constitutional law canon after the Constitution. Coburn, an obstetrician, asking the then-Solicitor General of the United States to read The Federalist Papers is roughly equivalent to me, an enthusiastic pickup player who got cut from my high school team, suggesting that Steph Curry watch some YouTube videos on jump shooting. This is not to suggest that non-attorney senators are simpletons who must supplicate themselves before the Holy Grail of Learned Law Men. But even with help from staff attorneys, most Committee members cannot be expected to ask nuanced, incisive questions about the outer limits of jurisprudential thought. However! Confirmation hearings are high-profile opportunities to score points with constituents, and like all good politicians, Committee members do not pass such things up. Hearings therefore consist largely of senators from the president’s party offering softball questions to make the nominee look good, and the other side conjuring up a treasure trove of reasons why confirmation would signal the end of democracy as we know it. Questioning order proceeds by seniority, so staffers review the record of the senator that precedes their boss, anticipate likely talking points, and craft questions designed to trap the nominee or give them the opportunity to defend themselves, as the case may be. Although questions may sound disjointed and scattered, confirmation hearings are actually a series of carefully orchestrated partisan arguments, rebuttals, and rebuttals to rebuttals. If substantive grounds for opposing a nominee are scarce, senators sometimes just make stuff up, which is fun. Straight-faced (?) Senate Republicans urged the rejection of Justice Kagan because she held “anti-military” beliefs (she briefly and legally barred recruiters from Harvard because the late “Don’t Ask, Don’t Tell” policy violated the school’s nondiscrimination rules) and was a secret SOCIALIST (she wrote a paper in college about socialism). When a candidate’s past contains neither smoke nor fire, opponents shrug, pull the manual alarm, and hope that the fire department soaks everything anyway. But wait, are hearings going to happen this time? Right. Given the proximity of Justice Scalia’s death to the upcoming election, Senate Majority Leader Mitch McConnell has loudly promised that the Senate will not consider or confirm ANY replacement under ANY circumstances until after Inauguration Day. Part of me wants President Obama to nominate a robe-clad robot capable only of quoting Reagan just to see McConnell’s bewildered, crestfallen press conference. McConnell’s plan is a terrible idea. But is it allowed? Because this is law, the answer is an infuriating “maybe.” This Court vacancy has spawned a slew of scorching takes over whether the Senate has a “duty” to act, and if so, what that duty entails. Republicans astutely note that nothing in Article II compels them to consent to anyone, while Democrats retort that McConnell’s stance runs afoul of the myriad courtesies and traditions on which the Senate operates. Since both sides have fair points, your opinion on whether this is okay probably correlates strongly with which party’s presidential candidate you plan to vote for in November. Say the Senate caves and holds hearings. What’s next? The Committee sends its non-binding recommendation on the nominee to the full Senate, where the candidate needs a simple majority vote to win confirmation. However, practically speaking, nominees need 60 senators in their corner, not 51. In order to defeat a filibuster threat, three-fifths of the Senate must vote for cloture, a motion that ends debate and forces a yes-or-no vote. Unless a nominee can secure cloture, their opponents can threaten to keep debate open indefinitely until everyone gives up because they are tired and cranky and have to pee. Supreme Court filibusters are rare. The last successful attempt came during the Johnson Administration, and even a candidate’s staunchest opponents are usually reluctant to resort to this level of obstructionism. However, Republicans hold enough seats to defeat a cloture vote, and certain GOP senators are VERY interested in reserving this power for the next president, so don’t rule it out. This whole process sounds inane. Pretty much. In 1803, Chief Justice John Marshall declared that the Court’s job is to “say what the law is” (again, maybe AP Government bells are ringing right now), and since then, it has been the closest thing the country has to a secular moral compass. Because this has resulted in both good and profoundly depressing things, people sensibly want to know how its members view the world. The process designed to find this out, though, has become a silly charade that is no less silly just because it runs on C-SPAN. Just remember that the next lucky pajama-wearer will make it to the bench by being reserved, mysterious, and boring. Keep your crossword puzzles ready. Jay Willis is a lawyer and writer in Seattle. He misses the Sonics and covers politics, sports, and Taylor Swift at Needs Further Review. Find him on Twitter @FarragutWest. The RNC And The DNC Are Finally Over; Did Anything Actually Happen?